Every day the BoldHeart Mama has an opportunity to reconnect with her authentic and true self—in all her varied roles—through the five BoldHeartMama Anchors: Peaceful (Part 1 & Part 2), Connected, Nurtured, Purposeful, and Inspired. Nature is a core element in the BoldHeart Life. When Roscoe was 2 years old and Merritt was 7 months we moved from Northern Virginia to Richmond, and I quit my career to launch a birth services concept called MamaBorn. That year I also re-entered individual therapy to retrospectively dig into and unwind my story of Merritt's early birth and subsequent postpartum, and all the cumulative thoughts I was feeling at the time about my first years of mothering and the ways in which I was found and lost in my experience. Motherhood had come on fast and furious—in less than two years I had carried and birthed two little boys. I was a new mama and had been pregnant or nursing (or both) for over three years. I was mothering night and day and with the career shift I also had a new business to get off the ground which translated to full time working hours, mostly accrued in the evenings and on the weekends: teaching birth classes, meeting with clients, networking, volunteering in my community, and being available on-call to attend client births several times a month. I felt a deep sense of purpose within my family and in my work but I was struggling to find a balancing point for myself. That schedule I kept for several years was hard on my body and my energy—I was tired. Pushing through, making things happen, and overriding my own needs in order to meet the demands of my kids and my work had become a reflexive second nature: preparing healthful food for them, and then eating on the fly whatever was within arms reach when it was my turn; nursing day and night to my own deprivation of sleep; caring for little ones all day and then rushing out of the house at night to teach or attend an overnight birth. I still carried baby weight from my pregnancy with Merritt, and I was hard on myself. I had lost touch with what it really felt like to be hungry, to know what it felt like to be rested. I had stopped listening to my body when, ironically, my passion work in birth was grounded in that very concept. Listen to your body. Trust your body. Love your body. With the start of therapy I commenced a Year of Self-Love in pursuit of learning to nurture and love myself with the same intention and passion that I nurtured my most important relationships. Whenever my therapy sessions veered off into a monologue of exhaustion or frustration or anxiety my therapist would bring me back to self-care. "What are you doing now for self-care?" It took me a long time to understand what she meant by this term "self care" and how that concept translated to my every day reality. As I wrote last year in a work/life balance interview series: "I thought for a long time that self care meant going to the dentist, getting my haircut—stuff I needed to do to take care of myself, right? I have since reframed self care as an opportunity to refuel, it's the stuff in life that brings joy and pleasure." I go to bed at 10 and get eight hours of minimally interrupted sleep a night. I exercise most days. I listen to my body’s signals for hunger and fullness, and eat mindfully allowing food to serve as fuel and pleasure. I make time for monthly dates with Andy and friends. I have reliable bouts of solitude built into every week. I have time to read and write and be in nature, and pursue little projects like knitting or cooking classes and other learning opportunities. I treat myself to haircuts, pedicures, makeup and self-care products that make me feel good. I have polished, well maintained, and comfortable clothes, pajamas, and undergarments. I maintain my health with regular preventive care, therapy, medical, and dental care as needed. Almost two years ago I transitioned again—from working mama to stay at home mama—to pursue my writing and my mentorship of Roscoe in our homeschool. Those decisions were inspired and anchored by my self care practices, which continued to develop as the boys grew older and more independent, and as I continued to cultivate them with my intentional attention. With time and practice I was able to integrate balance, a sweet spot where I could care well for myself and rightly care well for my kids and my family. I would have loved for time to have stood still in that capsule of equilibrium but the space I had created for my whole self eventually made room for our consideration to add another little person to our family. Now almost 14 weeks pregnant, taking care of myself over the last few months has been more an act of survival than pleasure as I've whittled down my needs to the bare minimum of sleep, healthful food at the ready, and daily exercise, while offering myself compassion to let otherwise important things fall to the wayside without guilt: two months ago I forgot an important anniversary of a friend; I haven't hit publish on this blog in weeks; I have declined making commitments because my stamina has been so low and I've prioritized the evenings for sleep and exercise. I know I can't hermit myself away forever, but this is a temporary state that demands a more acute listening to my body and heart with a responsive disposition. I've homed in on comfort and taking it easy, which means cozy socks and pajamas, and new undies that fit right, and embracing maternity jeans at ten weeks. It's being mindful of my SPD and opting for a long walk at the river instead of grinding out another road run. But movement is also a hobby and passion of mine so taking good care of my whole self also means running when it feels good to run. Mothering is all consuming, and it takes everything you’ve got (plus some!). Putting Self first can be a boggling concept, especially in the early years of parenting because you are needed. so. very. much. The idea of taking time out or away may feel nearly impossible. You may not even WANT to take time out or time away—I know I didn't—but there will come a time when you will be ready. Self care begins with the attitude that nurturing your core being is not an act of selfishness, and with the belief that your attention inward will grow infinitely outward to everyone's benefit. This is a gift only we can give ourselves: to self actualize our needs and wants with the intention to fill ourselves up. You may likely find that it also brings your best self into the light for the ones we love most. It can be as much for them as it is for us. These practices don't need to cost a lot, or require a big time investment. While I find time alone to be one of the best forms of self care it is not a prerequisite that you separate from your children if that's an unwanted or difficult option. Greater mindfulness, rest, a break in the form of a cup of tea overlooking a serene backyard, escaping into the next chapter of a good book, cooking adventures in the kitchen, or treating yourself to little things that bring comfort and luxury to everyday can all be done with little ones underfoot or in short bursts throughout the day. My idea of self care may not be yours. Just because your girlfriend gets a pedicure every two weeks doesn't mean that you will feel nurtured doing the same. This is about feeding the parts of yourself that call to you, whether it be for adventure, solitude, discovery, or companionship. There are many facets that make up a good life, and as many ways to nurture yourself. Your self care practice should be about spending time engaged with your life in ways that bring pleasure and joy, peace, relaxation, connection, inspiration. Activities that refuel and energize your spirit in order to proactively tackle and navigate your responsibilities with calm and intention. Truly nurturing activities are those you choose for yourself not because you should, or because you feel guilty if you don't, but because they move you closer to knowing your whole self. Know what you want: It will be different for every mama, but you first must know what you need and want for yourself before you can begin to pursue it. Identify the activities that fuel you, make a list! Try out different things and see how they make you feel. In time you will find your sweet spot. 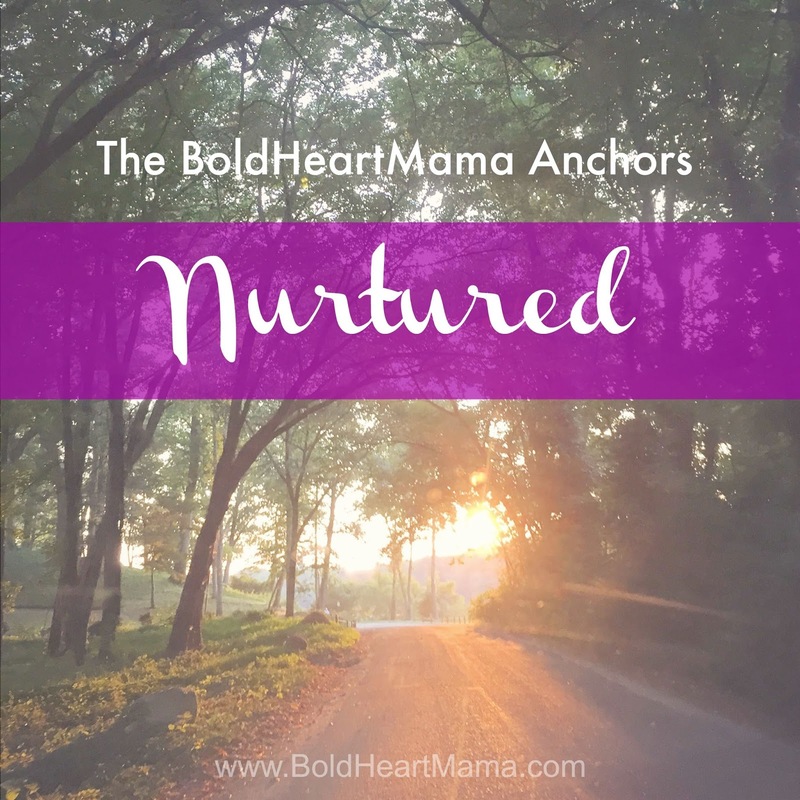 When I think of the word nurtured, what comes to my mind? What would it mean to feel nurtured and well-cared for in my life? What would that look like? Be very specific. What can I add, delete, or change about the way I do things to bring life to what I have described above? What would make me feel good right now? If I had 1 hour/6 hours/24 hours to myself how would I choose to spend that time? Let it be known: Communicate your desires to everyone around you—your partner especially—and enlist your support system to help you make it happen. Discuss ways you might shift your routines to accommodate these new ways of thinking and being and doing, you may be surprised to find that your partner isn't getting enough self care either. Use that opportunity to negotiate new routines in both your favor. Maybe there are parts of your day, or aspects of your responsibilities, that you can outsource in order to gain more time to meet your own needs: babysitters, cleaning help, meal and grocery delivery services. Make a compelling case for how self care will benefit the family dynamic. And if you (or your partner) aren't so sure yet, just give it a try: take some time for yourself and see how you feel afterward. See what you bring back to your kids and your partner and the ways in which your investment ripples out to touch everyone. Schedule it: Pencil it in, protect your time. Set boundaries, and practice saying no to others so you can say yes to yourself. Thank you so much, I had been telling myself the need for therapy after 5 years of mothering was selfish that I just needed to pick myself up but so much of this article has resonated with me and I realise now that 5 years of mothering has stripped me to the bone and some help making a plan to put myself back together is just what I need. Your honesty and openess is inspiring and motivational.